I was standing at the sink when the clematis plant in our garden caught my eye. 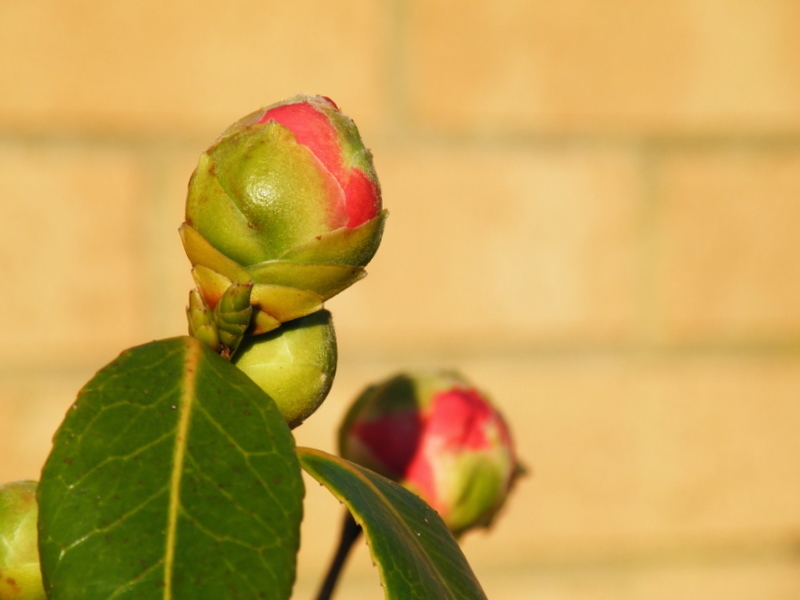 I looked at the large buds beginning to bear the vibrant colour of what will soon become the petals, and smile at the anticipation of watching it bloom. But then I looked away from the Clematis and scanned the rest of the garden. I realised then that it’s unlikely I’ll catch those buds open out into flower. The rest of the garden has very much shut up shop for winter. I applaud those gardeners who meticulously work their garden into a seasonal rhythm so that their little piece of paradise is always brimming with flowers. We can’t do that. We call it a success when we have some kind of floral display in summer. And I don’t think we’re alone. I’d think that most gardens are geared around the warmer months. Why? So they can be enjoyed when it’s warm enough for us to be outside. In the winter months we almost never go into the back garden. When this clamatis blooms it will be beautiful but there will be no one out there to enjoy it. So I watch this clematis, knowing the bigger picture, willing it to just hold on, to just wait it out a little longer until it gets a little warmer and everything else starts to grow again. As beautiful as it is as a plant is it’s own right, I know it would be so much more magnificent if it could only reach it’s full potential when the rest of the garden is in bloom. But as much as I silently urge the buds to wait for spring, I know that the plant is determined to flower as quick as it can. Although the gardener knows that it will be be a waste for his flower to bloom when the rest of the garden lies dormant, the clematis is indifferent to its’ surroundings. Do you see what’s coming next? So often we have our own agenda. The ‘gardener’ knows there is a reason for waiting but we’ll stick with our own agenda thank you very much, because it makes much more sense to us. And even if our purpose is right, we want to hurry it through to full bloom as quickly as possible. We live in a world where speed is almost always the priority. When we eat out we don’t want to wait, When we stand at a store check-out we don’t want to wait. When we order something on-line we don’t want to wait. We want to lose weight but we don’t want to wait (or is that just me?!). We just don’t want to wait! We fix our eyes on the prize and run at it full pelt, God help those who (even accidently) stand in our way. If we’re honest we bring this mentality of instant gratification to our God given purposes. We pray for something and expect next day delivery. We feel God has laid something on our heart and then question our discernment as soon as obstacles block the path. This is less about the what and more about the when. You can see time and timeagain in the Bible where God has clearly laid out a plan to someone yet seems to have forgotten the fineprint. Those minor little practicalities of how long it will take. We often have our own timescale to the vision God has put on our heart, and it never includes hanging around. Our action plans are based around human capacity and capability. All the while God whispers his plan for the vision he gave us and gently calls us to just wait for now. But we don’t hear. Our ears are filled with buzzing sound of our own agenda and the white noise of our lives. If we push through with plans in our own time-plan and in our own strength they might well come through ok. Just like my Clamatis it might even look quite good. But it will miss out on just how incredible it could have been. It will miss out on being part of something bigger and greater. It’s ironic that misplaced passion and dedication to something could result in us missing out on part of what we were passionate about in the first place! I don’t write this as a discerning wise woman. I hate waiting. I’m like a cat after a mouse once an idea has been birthed within me and it makes complete sense to me to just go for it (and keep on going for it full throttle until the idea comes to fruition!). I’m impatient, impulsive and stubborn. God bless my husband. So from experience I know how frustrating it feels to have a vision that is only just beyond my reach. I could tell you story after story of me bulldozing my way through something that I ‘know’ God wants me to do and do now. For a long time the idea of having to wait days or weeks would frustrate the living daylights out of me. I’ve not long realised that eternity isn’t as fussed about the difference between one week and six weeks, like we are. It’s not a coincidence that throughout the bible God fulfills his promises after a season of waiting. David was annointed as king years before it came to pass. God gave Abraham and Sarah a wife a son after a painful time of waiting. God told Joseph that his brothers would bow down to him but Joseph went through a whole lot of ‘life’ before it happened. More often than not God takes us the long way round to reach what He has promised us. There’s way more learning to be gained that way. The psalms are packed full of this idea of waiting on God. In Psalm 27:14 it says “Wait for the LORD; be strong and take heart and wait for the LORD”. When we truly stop where we’re at and wait for God He always shows up. Sometimes he shows up so quietly that you might not even know it. The God who made everything we see and feel is not an instant gratification God. He’s a God who wants you to rely on him, wait for him, listen out for him. We’ve forgotten how to wait. Living in this society of gimme gimme gimme and now now now we just don’t know how to stop. We need to learn how to relax into the peace that comes when you accept the God has the bigger picture and he has it all under control. We need to learn as God’s people to rest in Him. There is ultimate freedom in handing our time-scales over to God – it means we don’t have to stress about the fast pace competition anymore! It can happen so quietly without you even knowing it. Taking our eyes off Jesus for just one moment and then our eyes become stuck on something else. That’s why God asks us to daily die to ourself, to daily fix our eyes on him and to daily lay our agenda’s and time-frames at the cross. It’s all a waiting game.